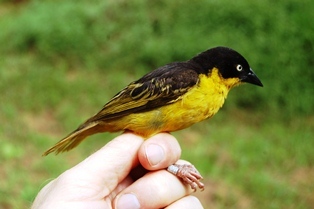 Kenya is the country with the highest diversity of weaver species (over 60 species) of any country in the world. 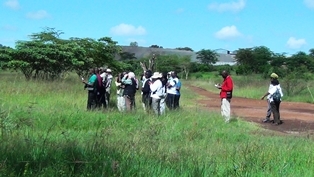 Thus part of the Project for the Enhancement of Research Capacity (PERC, UCT) funding was to hold PHOWN (PHOtos of Weaver Nests, http://weavers.adu.org.za/phown.php) workshops in Kenya. 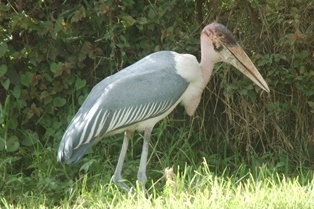 The first was hosted by the Ornithology section of the Nairobi National Museum. 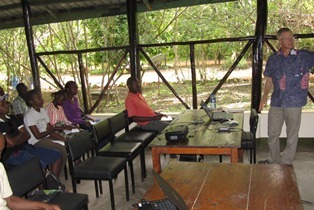 The second workshop was hosted with A Rocha Kenya and the Kenya Wildlife Service at Gede Forest Station, KWS Education centre, Watamu on the Kenyan coast. 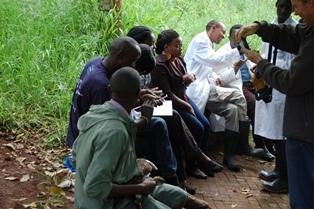 Three lectures were held, one on each afternoon, starting with Weaver breeding biology. On Tuesday the lecture was about the Photos of Weaver Nests (PHOWN) project, covering how to upload records to the ADU Virtual Museums, and the goals and summaries available for PHOWN. 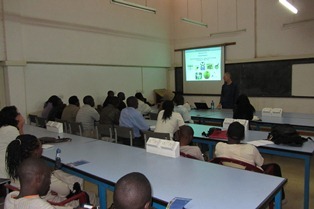 On Wednesday there was a lecture on weavers in Nairobi, and WRAP (Weaver Research Africa Project). This was followed by a discussion led by Colin Jackson on Kenya taking part in SABAP2. The workshop was well attended with over 30 participants, and some participants uploaded PHOWN records during the workshop. 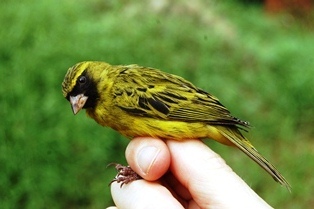 On Tuesday mornings the Nairobi ringing group holds a bird ringing session in the museum gardens. Colin had started this in the 1990s and the group is still going strong. 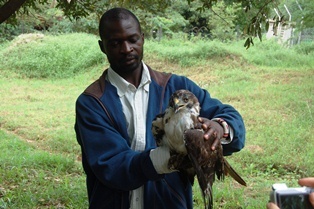 A surprise catch was an immature Augur Buzzard in the mist nets - Colin was quick to extract it, before it escaped. Weavers caught were some Baglafecht Weavers and Village Weavers, and a range of other interesting species were caught. 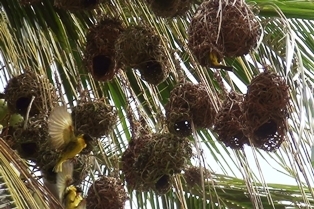 Both weaver species have nests in the vicinity of the museum. For some 40 years Fleur Ng'weno has been leading the Wednesday Morning Bird walks for the East Africa Natural History Society. On 30 May she led an outing to the Uhuru Gardens in Nairobi. 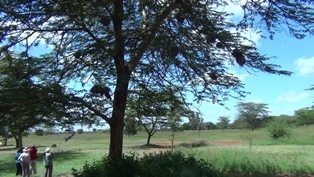 The gardens have several habitats, including grassland, woodland, and a small wetland. 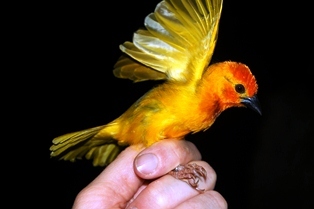 A wide variety of bird species were seen, as well as several weaver species with nests. Several White-browed Sparrow-Weaver colonies were found, and at two of these adults were observed as feeding chicks. 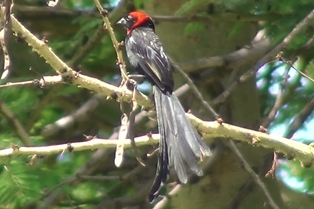 The most interesting PHOWN record is that of a Red-collared Widowbird - this is the first PHOWN record for the species and the nest contained 3 eggs, see VM 2411; males in eastern Africa have a red crown and nape, unlike males in southern Africa. To view all the PHOWN records from the bird walk, see here. 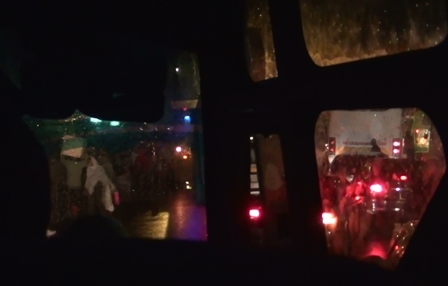 Colin and I took an overnight bus as transport to the coast. Traffic in Nairobi is worse than traffic in Cape Town. 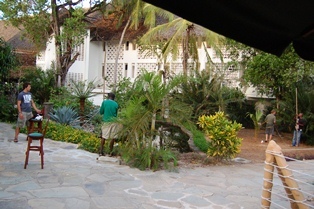 In Watamu I stayed at the Mwamba Field Study Centre, where the ADU had previously run an AEWA/AFRING ringing course in 2004. On Friday evening a team went to Turtle Bay Beach Resort to ring weavers. Several weaver species roost in bushes and trees along a water feature, and in September breed here (see VM 2416). 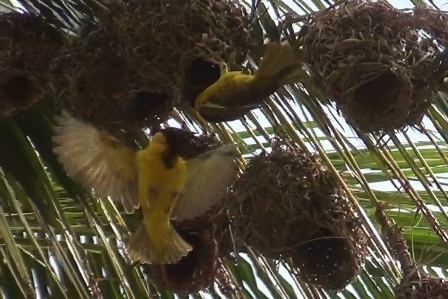 We caught 60 birds, mostly Golden Palm Weavers, some Eastern Golden Weavers and a Lesser Masked Weaver. 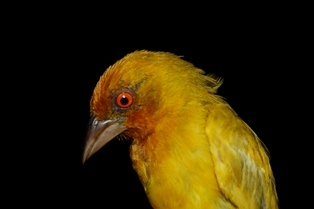 The Eastern Golden Weaver (previously known as Yellow Weaver in southern AFrica) has an orangy face in Kenya. 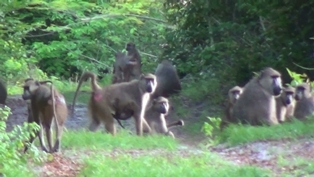 Two weavers were processed and released while it was light, but the majority were taken around the corner to Mwamba for ringing, and were released at sunrise the next morning at Turtle Bay. 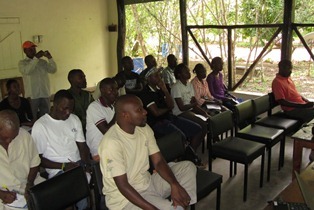 On Saturday morning the PHOWN workshop was presented at Gede Forest Station, KWS Education centre. There were intermittent power outages, but the workshop was successful nevertheless with 24 participants attending the morning lectures. On Sunday morning bird guide Jonathan Baya took me into the Arabuko Sokoke forest. 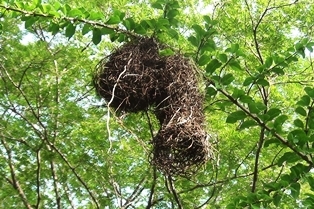 We found several Dark-backed Weaver nests and also adults. 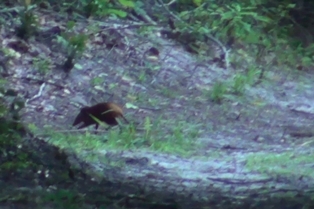 Mammals included Yellow Baboon troops and a Golden-rumped Elephant Shrew (both submitted to MammalMAP). We briefly visited Lake Chem-Chem but there were few weavers. Back in Watamu Jonathan knew of a Village Weaver colony - it was active, being the only active weaver colony found this weekend. 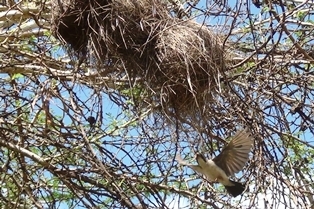 Weavers on the Kenyan coast seem to breed more often during or after the short rains (Sep-Nov).